Tiffany & Co. 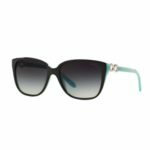 Sunglasses Women’s 4111b 82013c Plastic : Marble red plastic frame, Grey gradient plastic lenses, light rectangular shaped. Product comes with an original Tiffany & Co. carrying case, cleaning cloth and manufacturer’s booklet.